You can access a variety of clip properties in AviSynth scripts. For example, if the variable clip holds a video clip, then clip.Height is its height in pixels, clip.FrameCount is its length in frames, and so on. Clip properties can be accessed like script variables, except that they are read-only (in C terminology, they cannot be L-values). Returns true if the clip has audio, false otherwise. Returns true if the clip has video, false otherwise. Returns the width of the clip in pixels. Returns the height of the clip in pixels. Returns the total number of video frames contained in the clip. 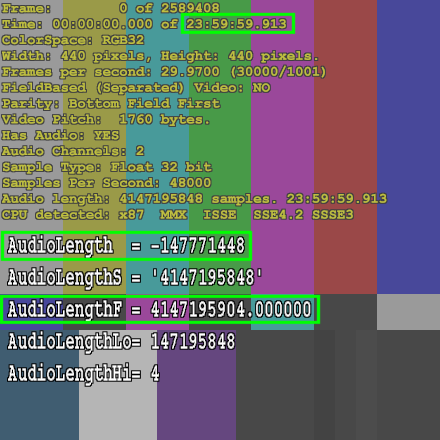 so for the precise number, use FrameRateNumerator and FrameRateDenominator. Returns true if the clip is field-based. What this means is explained here. Returns true if the clip is frame-based. What this means is explained here. Returns true if frame f (default 0) is the top field of a field-based clip, or if it is a full frame with top field first of a frame-based clip. Returns the pixel type as a string, eg "RGB32". Returns true if the color format is Planar, false otherwise. Returns true if the color format is Interleaved, false otherwise. Returns true if the color format is RGB, false otherwise. Returns true if the color format is RGB24, false otherwise. Returns true if the color format is RGB32, false otherwise. Returns true if the color format is YUV, false otherwise. Returns true if the color format is YUY2, false otherwise. Returns true if the color format is Y8, false otherwise. Returns true if the color format is YV12, false otherwise. Returns true if the clip color format is YV16, false otherwise. Returns true if the color format is YV24, false otherwise. Returns true if the color format is YV411, false otherwise. AVS+ Returns true if the color format is 4:2:0, false otherwise. AVS+ Returns true if the color format is 4:2:2, false otherwise. AVS+ Returns true if the color format is 4:4:4, false otherwise. AVS+ Returns true if the color format is Y-plane only, false otherwise. AVS+ Returns true if the color format is YUVA, false otherwise. AVS+ Returns true if the color format is 16-bit RGB (RGB48), false otherwise. AVS+ Returns true if the color format is 16-bit RBGA (RGB64), false otherwise. AVS+ Returns true if the color format is Interleaved RGB (RGB24/32/48/64), false otherwise. AVS+ Returns true if the color format is Planar RGB, false otherwise. AVS+ Returns true if the color format is Planar RGBA, false otherwise. AVS+ Returns true if the color format has an alpha channel; (RGBA or YUVA), false otherwise. AVS+ Returns 1 for 8-bit formats, 2 for 10/12/14/16-bit formats, 4 for 32-bit float. AVS+ Returns 1 for Y-only formats, 3 for RGB and YUV, 4 for RGBA and YUVA. AVS+ Returns bit depth per channel – 8, 10, 12, 14, 16 or 32. The easiest way to get a clip’s duration in seconds is AudioDuration. However, due to the limits of 32-bit floating-point math, the result is very close (within milliseconds per 24-hour day), but not exact. AudioLength returns a clip’s exact audio duration in samples. However, this is limited by the range a of 32-bit integer; with a long enough clip (at 48kHz sample rate, somewhat over 12 hours), the result wraps around to a negative number. For an accurate sample count over long durations, AudioLengthS returns the number as a string, and AudioLengthHi×109+AudioLengthLo returns the full 64-bit value. Unfortunately, attempting to do precise arithmetic using either of these numbers within AviSynth runs into the same 32-bit math issues as mentioned above. Returns the audio sample rate. Returns the audio duration in seconds. Returns the total number of audio samples, per audio channel. Returns the total number of audio samples as a float-point number. No overflow limit, but there is a possible precision limit – see Examples below. Returns the total number of audio samples as a string. clip.AudioLengthLo returns the total number of audio samples, modulo m, which is 109 by default. clip.AudioLengthHi returns the total number of audio samples, divided by d, which is 109 by default. Therefore, assuming m==d, the (possibly 64-bit) total equals AudioLengthHi × m + AudioLengthLo. Returns the audio bit depth, eg, 8, 16, 24 or 32. Returns true if the audio format is Float. Returns true if the audio format is an integer type. Clip duration = 10 seconds. All AudioLength forms agree. \ + "\nAudioLengthS = '" + AudioLengthS + "'"
Clip duration approximately 24 hours. Integer AudioLength overloads (wraps around to a negative number), while the floating-point form has lost several digits of precision.